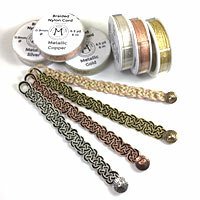 Choose the best metallic cord or thread for your next projects! 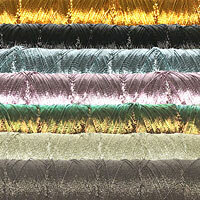 Choose the best metallic for your next kumihimo projects! 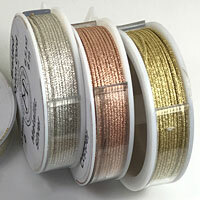 Metallics cord or thread usable for making jewelry are hard to find. Often metallic cord and thread do not have enough tensile strength to be even considered - they break too easily, or they are too scratchy... 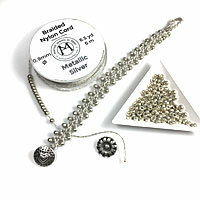 Check these two types of metallic cord and thread and the free DIY tutorials available using these cord and thread. 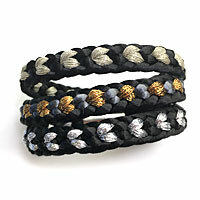 These metallic thread/cords are incredibly soft and pliable and well suited for kumihimo and braiding. They come in three finishes: shiny, iridescent, or fine. We recommend them for blending into braids to add metallic accents and for the 8-Strand Flat Kumihimo Bracelets with Hearts & Metallic Accents shown below. 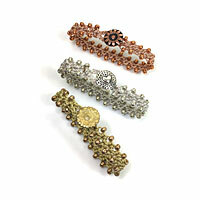 The free DIY bracelet tutorial is available HERE. Made in Japan with a gimp thread construction. 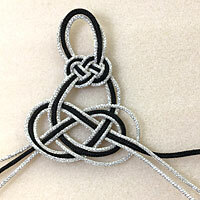 This metallic braided nylon cord is about 0.9 mm in diameter. It is very strong. Metallic nylon thread are braided around a white central nylon core, just like Chinese Knotting Cord. 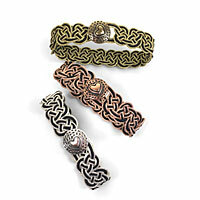 We tested this cord as a pendant cord and for the Celtic bracelets shown here. The free DIY tutorial is available HERE. 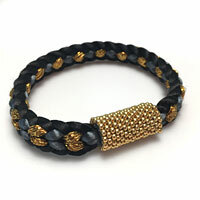 Made in China with a braided thread construction with a central nylon core. Still not sure that's what you are looking for? Email us to get samples!